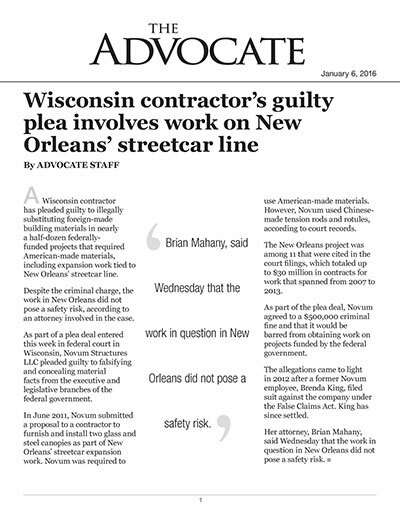 A Wisconsin contractor has pleaded guilty to illegally substituting foreign-made building materials in nearly a half-dozen federally-funded projects that required American-made materials, including expansion work tied to New Orleans’ streetcar line. Despite the criminal charge, the work in New Orleans did not pose a safety risk, according to an attorney involved in the case. As part of a plea deal entered this week in federal court in Wisconsin, Novum Structures LLC pleaded guilty to falsifying and concealing material facts from the executive and legislative branches of the federal government. In June 2011, Novum submitted a proposal to a contractor to furnish and install two glass and steel canopies as part of New Orleans’ streetcar expansion work. Novum was required to use American-made materials. However, Novum used Chinese-made tension rods and rotules, according to court records. The New Orleans project was among 11 that were cited in the court filings, which totaled up to $30 million in contracts for work that spanned from 2007 to 2013. As part of the plea deal, Novum agreed to a $500,000 criminal fine and that it would be barred from obtaining work on projects funded by the federal government. The allegations came to light in 2012 after a former Novum employee, Brenda King, filed suit against the company under the False Claims Act. King has since settled. Her attorney, Brian Mahany, said Wednesday that the work in question in New Orleans did not pose a safety risk.